Have you ever thought of being a little kid again? Where days went by without you worrying about what's going to your hips and thighs. Where running around 5 minutes made you perspire like 45 minutes extreme yoga. Where eating 2 slices of cake was "awww, so cute". I do. A lot. You would know that exact second when I decide to indulge my inner child. Especially when i proclaim random resolutions like "I ain't sharin' my burger!" or "All meat no vege!" or "I'm eating straight from the pot!" Unfortunately, I kid not. That's where the 6-layer cake comes in. And the rum...is just to congratulate us for getting over being a 5 year old. The cake I was looking for is a "black" cake. When I was searching for "the" recipe, I go to my favourite cake site and found this. However, things seemed a little too professional. Hence, I went to my new favourite site and found this same recipe. Who could resist challenging themselves, when 2 trusted individuals have tried-tested the recipe. Note: I've decreased the sugar from 400g to 266g. Added cocoa instead from 90g to 160g. Both sugar and cocoa absorbs water. I did this in order to not mess around with the texture of the cake. I wouldn't do it any other way. 1. Preheat oven to 180 Celsius/ 350 Fahrenheit. Line any number of equal sized pans you have with parchment paper. I used 8 inch pans. 2. Combine all dry ingredients (Flour, sugar, cocoa, baking soda and powder, salt). 5. Cool 15 minutes, remove from pan, cool on rack completely (I did not), wrap it in plastic with parchment paper still attached. Freeze. (for ease trimming and layering) You see, the cake puffed up while baking, deflate while cooling. Hence, trimming was necessary. You can skip trimming or freezing. However, trust me, they're prettier when trimmed. I chose buttercream. The baker in me needed to succeed in buttercream! 1. Read this post, than this post. Remember, don't worry. I'm here to testify my success. 2. Make sure Butter is cut into smaller pieces and not cold / warm. 3. Let's begin. Combine egg whites and sugar in bowl. Boil some water in a pot and place bowl like a double boiler. (Make sure bottom of bowl does not touch boiling water). 4. Continuously whisk the egg white + sugar mixture on top of simmering water for 4 minutes. Check that all sugar is dissolved (not grainy to touch). Mixture shouldn't be fluffy just yet. Remove bowl from double boiler. 5. Begin to mix on high speed. At first, there will be steam. Continue and it will fluff up. Don't stop just yet, don't worry about over-beating. Continue to mix until bottom of bowl does not feel hot or even slightly warm. It should feel almost cool to the touch. At this point, egg whites feel so heavy that its almost like marshmallows. If in doubt, continue mixing. 6. Proper beating of egg whites will assure you that the cream stays firm. This should take 10-15 minutes. My cue was the temperature of the bottom of the metal bowl. 7. Begin to add butter. Do this ever so patiently. Each cube should be completely incorporated before continuing with the next cube, 15 seconds each addition. 8. After halfway through, cream should look a little curdled. Stay calm. Continue adding the butter. By the end, it will look smooth. Note: Previously, my cream turned soupy at this stage, I chilled it in the fridge for 15 minutes as told, and ended up with a curdled watery mess. If this happens to you, do not throw it away. Keep mixing. KEEP mixing until you beat it to your will. Note: What changed? I mixed the egg whites persistently. Until the bowl felt cool to touch. Something i remind myself. Swiss meringue buttercream is forgiving. 1. I trimmed till my lil heart's content. 2. Place as equal an amount of cream as possible in between each layer. 3. Crumb coat. Chill cake. Lastly, I know this post has been overly too long, but let's not forget to describe how this cake tasted. The cake was extremely moist and soft yet thick and full of flavor. The cream was light, fluffy and oddly, I could almost taste fresh milk. When they told me you'd eat spoonfuls of this stuff, I was sceptic. I repent. Both tasted nothing like plain sweet. Together, they were opposites yet similar. Oh, if only I could tell you, how delicious they are together. I blame myself for these pictures that do not even remotely tell you how yum these are. wowwww, how long did this take you make? Holy Moly! This looks delicious, and it's absolutely beautiful! This is one totally amazing impressive cake! Not only is it a tall drink of water, but I love the "love" on top. Lovely x infinity. Wow that is impressive! Looks amazing! Where do you start with eating that?! You're the bomb. A six layered chocolate bomb. Wow, that cake is amazingly tall! I'm really impressed by how neat it looks and how well it stayed together - I could never manage that. @ Ms Lollipop: The fact that you made such beautiful macarons on your first try.... I have to admit my jealousy! Wow! Seriously, 6 layers? Heaven in a slice! Might be too tedious for me to work on, but I am bookmarking, because you'll never know when you need to indulge in the 6 layer cake comfort to feel better...Thanks! This is SO much fun! I love how each slice is an elegant tower of cake - indulges your inner child and inner greed all at once! 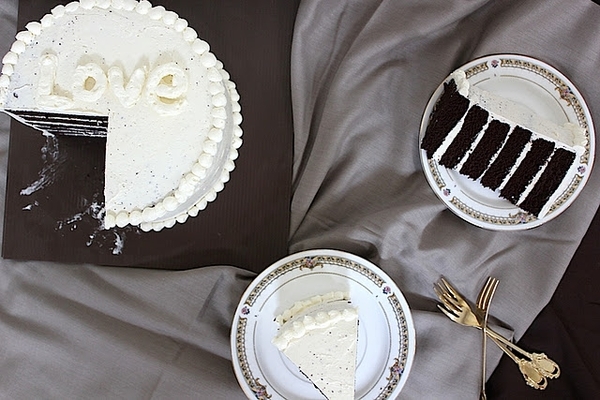 The dark chocolate contrasts beautifully with the pillowy white meringue buttercream too...your photos are gorgeous. Yummy cake and what a beautiful presentation!! I have a curry blog. If you want, we can follow each other! @ MyFudo: You can always make them for an occasion, unlike me. haha! @ Purabi: Curry?! I love curry!! Gorgeous layers! I could eat that as a meal. Wow! That looks ... mouthwatering... and ... beautiful!!! Great presentation and I bet it was delicious!!! This cake is seriously amazing. And gravity defying! It's huge! The layers are all so perfect too. AND I love your photography. Gorgeous pics. This looks like the best cake ever!! WOWZA - that is one awesome cake! And your blog is lovely! What a stunning cake! I love the black and white. you're awesome for making this wonderful cake. @ Diana: I do... eat cakes as a meal oh-so-very-often.... My hips are proof..
@ Nicole: That reminds me of Glee xD Thank you! @ Lindsay: WOWZA you back! This is an amazing cake. I have never made one that tall. So chocolatey. Hello! It looks so beautiful for the freakish thing that it is. 6 layers! I would love to try this. Soooooo chocolaty and that frosting looks DEVINE! Oh, my God!! A six-layer cake!! It looks great! you are a genius, this cake looks amazing ! This looks absolutely divine Jesica! Did you bake this at 4am? :) Absolutely worth it. This is a gorgeous looking cake. Would love for you to come and share this with us at foodepix.com. I'm sooo impressed with your cake! It looks great! Perfect work, Jessica! This looks like six layers of DANGER! 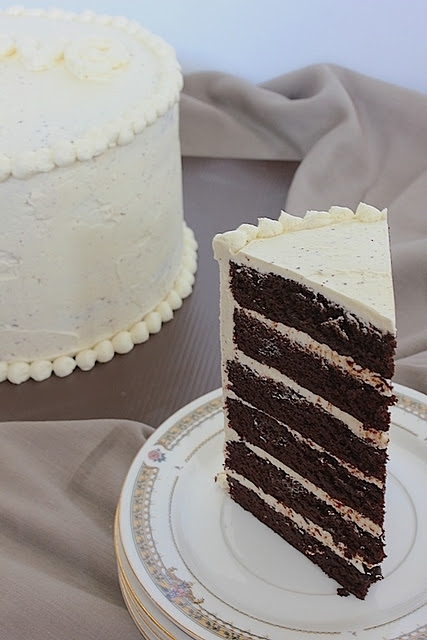 I love the idea of a rum buttercream with chocolate cake, gorgeous! Beautiful pictures! All your blogs are stunning...and this looks to die for! Yum! Wow. The cake looks amazing! Wow - this is really lovely! I am impressed. Not sure I'd be bold enough to attempt a six layer cake. @ Mrs F: Hahah! cheekiest monkey indeed! Put your head into it... I'm laughing, serious! holy shiitake mushrooms! SIX LAYERS?! absolutely divine! I made it today! i used a caramel swiss buttercream for the filling then the rum one for the icing. It was amazing!! the only thing i would mention is that there is not enough cake mix for 6 cake tins, i made it one and a half times the mix above. Amazing cake though! !